Attention, the plugin is useless without installing a theme "Octolanding"
All of the following features are ready to go right now. Meta tags - easy customization of tags. 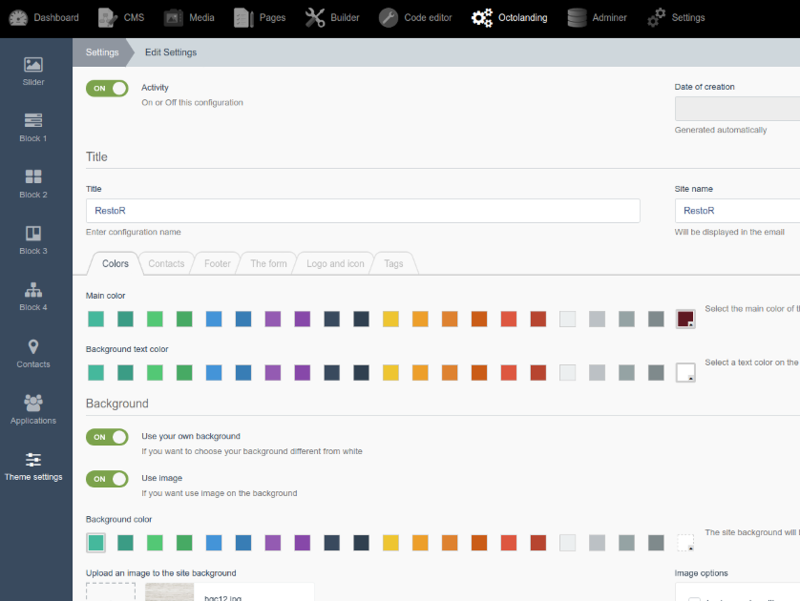 The OctoLanding plugin built into the theme allows you to create multiple configurations, and it is easy to switch between them. So let's move on to creation, to create a configuration profile, click on the “OctoLanding” item in the control panel in the left menu, select the Theme Settings item and click the Create button. Fill in all the required fields. Please note that under each field there is a comment that allows you to understand the purpose of this field. After successful filling save settings. In the left menu, select “Theme Settings” a list of created configurations will appear, make sure that the previously created configuration is active, this is indicated by a green indicator opposite the name! Attention! For the theme to work properly, it is necessary that any configuration be active. When you activate any configuration, the rest are automatically deactivated! The first word - “Slider” is the name of the menu item in the “OctoLanding” plugin, the second word is “Block Slider One Image and Text” and it contains the appearance of the plugin. Image 1. The appearance of the block Slider — Block Slider One Image and Text. The block is a single slide, the entire width of the screen. The block has two text fields for adding a first-level heading (Title 1) and a second-level heading (Title 2); this block also provides the ability to add a button (More detailed) with a link both to the block and to any other address. If these fields are not filled in, the slider will consist of just a picture. Image 2. The appearance of the block Slider — Five Slider Images. The block consists of 5 slides, which are limited in width by the container Bootstrap 4. ≥ 998px - 5 elements. Image 3. The appearance of the block Application — Two Field Form. The block is designed to collect user information, namely "Name" and "Phone", can be more one in page, as all the presented blocks. The block is limited in width by the Bootstrap 4 container. Block settings allow you to set the block name (Write to us), add or remove a subtitle (Any questions? We weill help you) and change the text of the send button (Send). After filling in the fields, the administrator will be notified via Email, and all applications can be viewed in the “OctoLanding” plugin - "Applications". The user who filled in the fields after sending will receive a message about the successful sending. Image 4. The appearance of the block Contact — Two Tiles Text and Map. 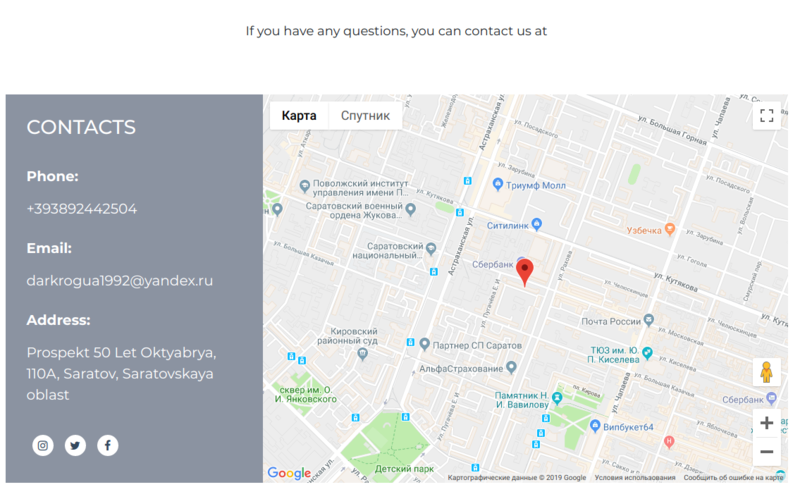 The block is designed to display contact information with a Google map showing the location, if this block is excessive for You, we recommend using the extended "Footer". The block is limited by the width of the Bootstrap container 4. User can set block name (Contacts), add subtitle (If you have any questions....) Add item "Phone" - when you click on the content of this item will be added to the link prefix" tel: "for the item" Email "will be added prefix" mailto: "for the item" Other " prefix will not be added. Social networks will be added automatically and their settings are common for the whole theme! Refer to social networks to set them up. For correct Google maps meets third-party plug-Graf Graf.Google maps it needs to be installed! Important to display the map, you must obtain the Api key. Image 5. The appearance of the block Block 1 — Block Tiles Icon and Text. 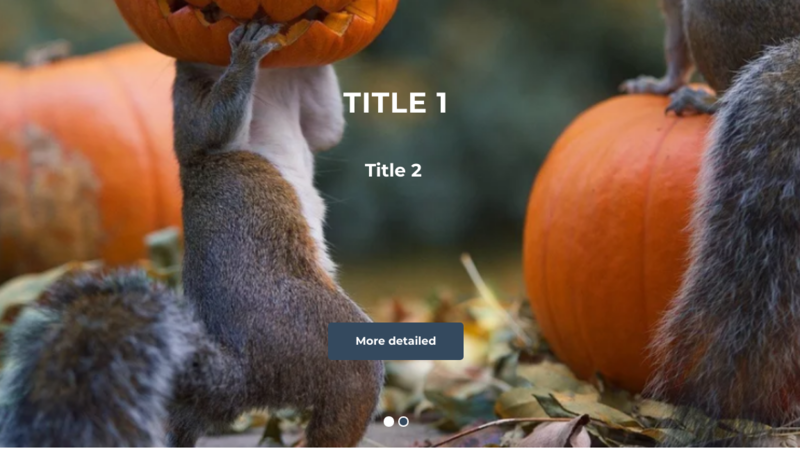 A block is a set of 2, 3 or 4 elements in a row (selected in the settings), each of which contains an image and a title (element 1) and text that is displayed to the user when you hover (in the image on the right) closing the image and title. If you do not fill this field, then nothing will happen when you hover. The block is limited in width by the container Bootstrap 4. 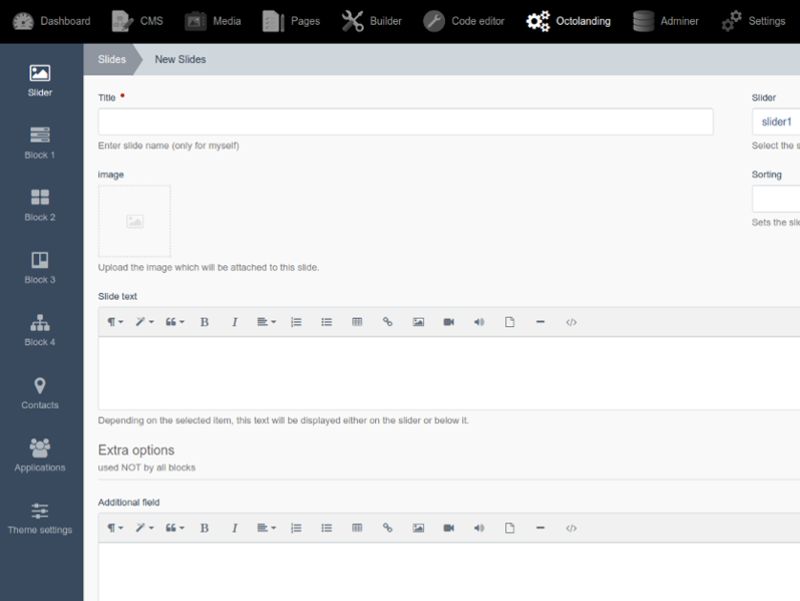 The user can change the title (Title), short content (Short descriptions) and add new elements. Image 6. The appearance of the block Block 2 — Two Tiles Text and One Slide. This block can contain an unlimited number of elements. 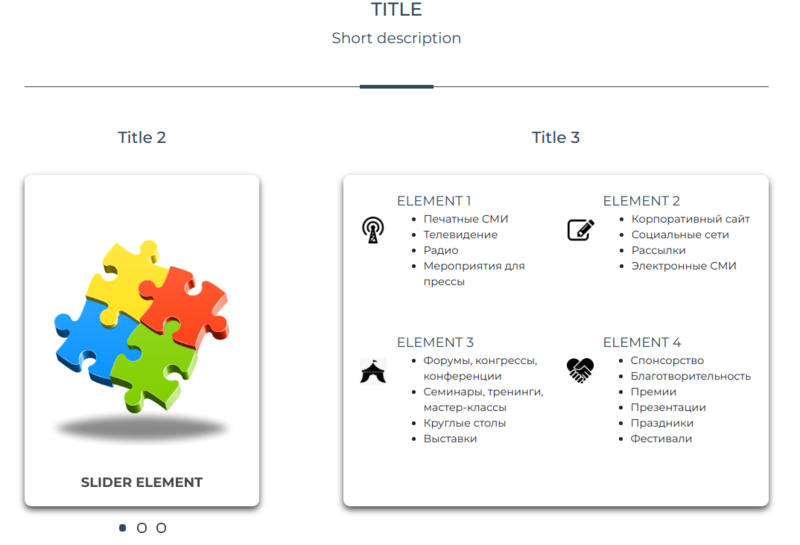 Each element added to the block is divided into two parts: text (Title2, Text block, More detailed) and a slider with one image. The block is limited in width by the Bootstrap 4 container. Main features Elements added to the block can be inverted if necessary (change the text part and the slider in places). 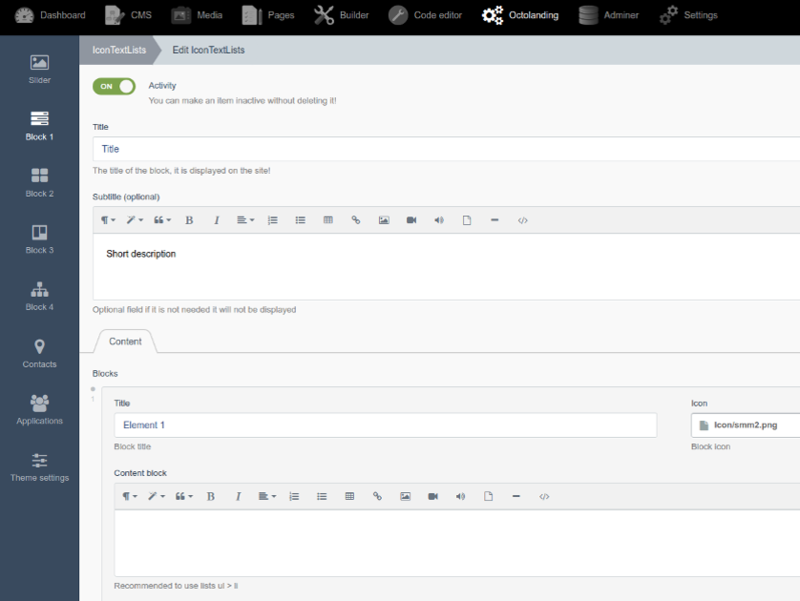 Add the “More detailed” button to the elements (the user will be displayed if the user has filled out the link field). Create anchor links for the item. Image 7. The appearance of the block Block 3 — Four Image slide Background. 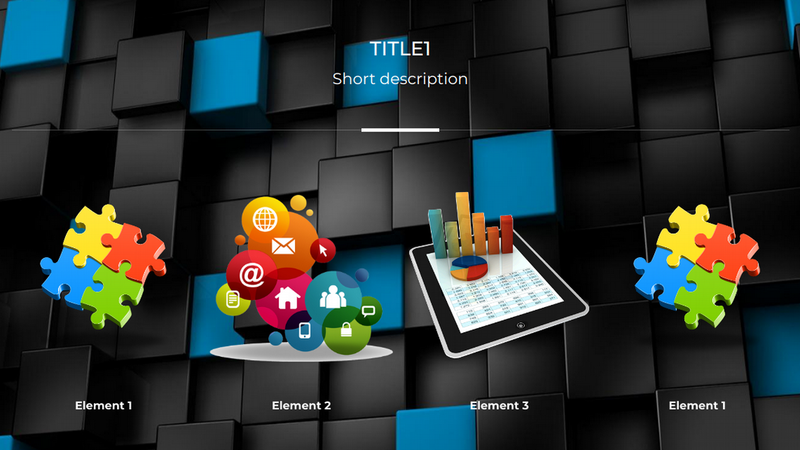 The block occupies the entire width of the screen, is a slider with its background consisting of 4 elements, depending on the width of the screen, the number of elements decreases. On this block, you can set your background as a third-party image, or fill the background with color. When you click on the elements of the block, the gallery opens with these blocks (can be turned off). If there is no description of the elements (Element1, Element2 ...), the description will not be displayed. If there is no block description (Short description), the description will not be displayed. Image 8. The appearance of the block Block 4 — Slider One Four Icon. It is divided into two parts: a slider and a text section. The block is limited in width by the container Bootstrap 4. 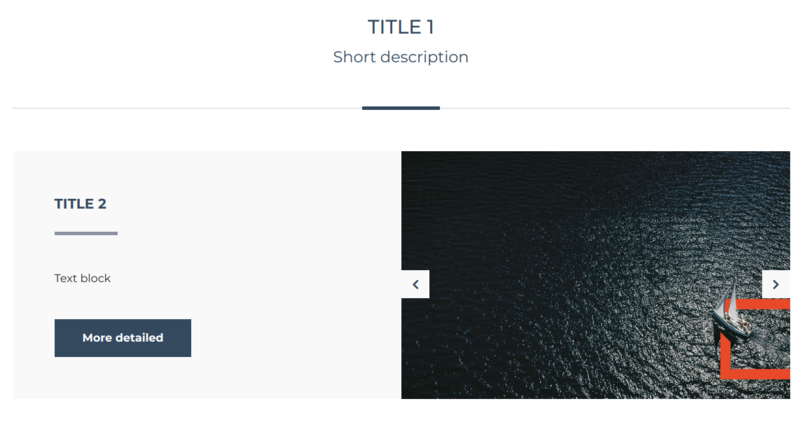 The left and right parts of the block have equal height, therefore, it is not recommended to place more than 4 elements in the text block otherwise it will be difficult to choose an image for the slider. Slider simultaneously displays only one image. 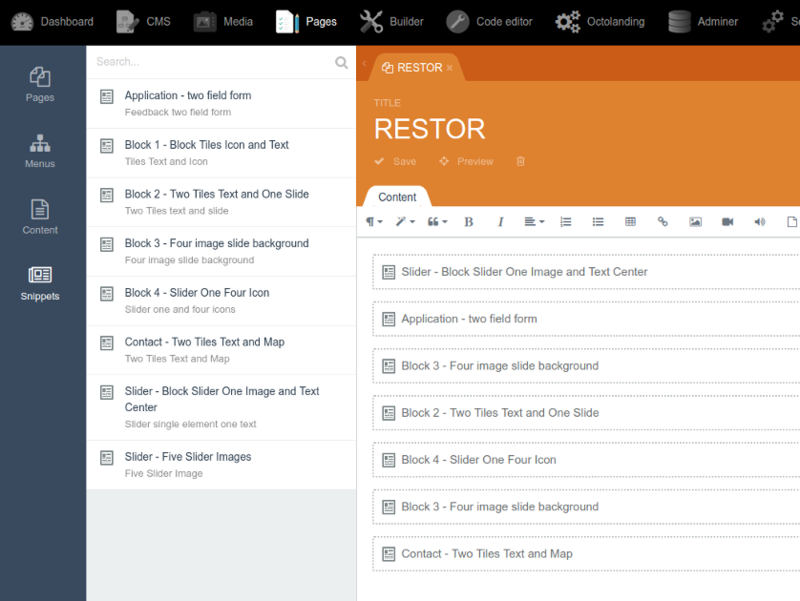 After reviewing in clause 2.2 with ready blocks, you can proceed to the creation of their copies. A block instance is a copy of a block with its own data. 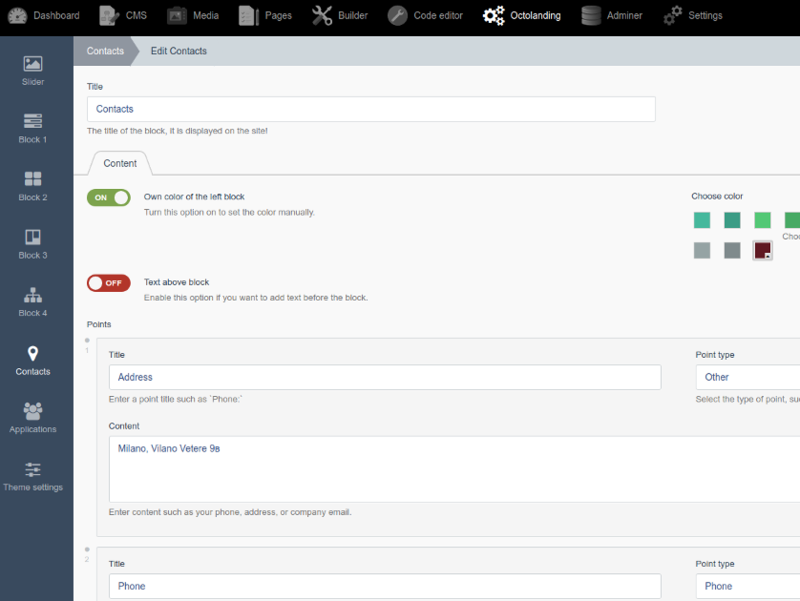 To create an instance of a block, select the OctoLanding item in the control panel, select the required menu item and click the create button, fill in the fields and save. Consider the example of Block 1 - Block Tiles Icon and Text. From the name of the block you can see that to create an instance of this block, the menu item named “Block 1” responds to the current item and press the CREATE button. Image 9. Creating an instance of Block 1. Customize headings and subheadings. Turn on the item Activity - this item enables or disables the block on the site Fill in the Title field - this will be the title for Block 1 (what the comment about the field tells us) If you need a subtitle, fill in the Subbtitle field, if you do not want to display it, then leave this field blank, as in image 9. Now you need to add items to the block, below the Content tab, click on the “Add item” button, the fields for the item will appear, we will move on to filling them out. Fill in the field Title is the title of the element inside the block Select an image for the item in the Icon field - displayed in the item to the left of the title (see clause 2.2) If we want some text to appear on hover over this element, then fill in the Content block field, otherwise we leave it blank. See the example of filling in image 10. Click the Create and close button. The block instance is created. Image 10. Creating an instance of Block 1. Adding elements to the block. By analogy, create for blocks where Slider is needed. Please note each instance has its own unique ID, according to this ID which instance of the block will be displayed on the page! Image 11. An example of creating a slider. After the required fields, there are additional fields that only in the Slider - Block Slider One Image and Text block, if you fill it in and connect this slider in another block, the field will not appear. Link - if the field is filled, then the button “More detail” will appear on the slide. Click "Create and close", a slider with one slide (image) is created, if necessary, create a few more slides for the current slider. Image 12. An example of creating a slide. In the control panel, click on the "Pages" item, select the page on which you want to add blocks (usually this is the main '/'). In the left pane, select the Snippets item. In this item, there are blocks that you can add to their website. 8. Clicking on the desired snippet (block) will automatically add it to the page. To add further blocks, move the mouse over the current block and the "new line" symbol will appear, click on it and select a new block, etc. Attention! It is recommended to add blocks one by one, otherwise each newly added block will be the first! Block name (string) - block name. 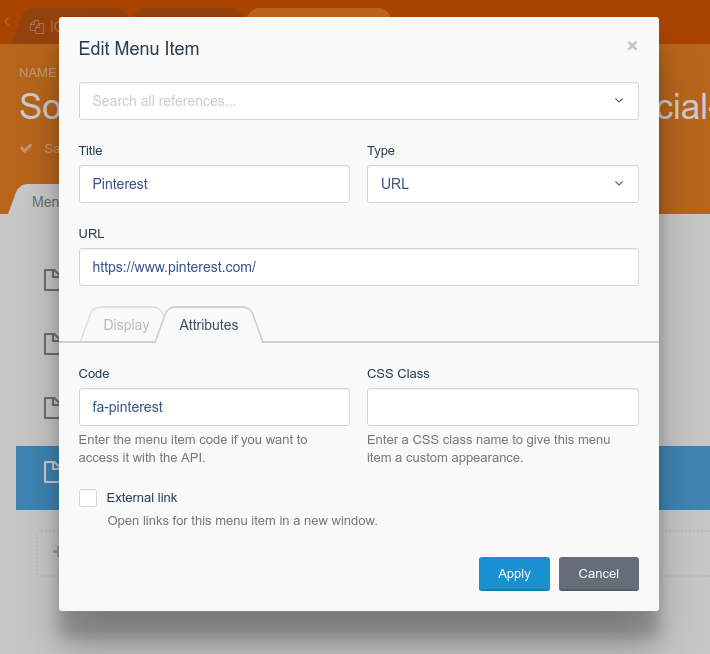 After adding the block to the page, configure the snippet fields, specify the necessary parameters and click save! Go to the page and check that the block is displayed correctly. Contact block - Two Tiles Text and Map. Image 14. 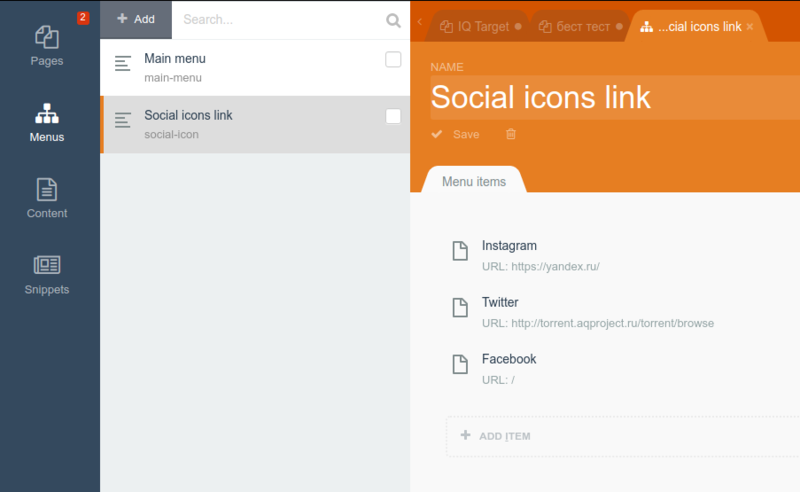 Manage social icons. To add a new icon, click Add Item, consider an example of adding an icon. In the Title field enter the name of the icon (for yourself only) In the URL field enter the link to your page. Go to the Attributes tab and in the Code field, paste the code to the icon taken from the FontAwesome 4.7 library. In this case, the element code looks like this &lt;i class = &quot;fa fa-pinterest&quot; aria-hidden = &quot;true&quot;&gt; &lt;/i&gt; You only need to write fa-pinterest, see image 15. Click Apply and Save. To edit, go to Pages-Menus — Main Menu. It is filled in the same way as point 5.1, except that the Code field should be left empty! Each block added to the page has a block URL parameter, if this parameter is filled, you can scroll smoothly to this block by clicking on the button or on the menu item that references the current block.